Elderberry bushes (Sambucus canadensis) have a number of uses. Today, they are most often planted as ornamental bushes or small trees. Many still plant the elderberry to harvest its small, white flowers and blue berries to make wines, deserts, jams and teas. The versatile elderberry bush is easy to grow and plant in the home landscape. It requires little maintenance and grows quite happily on its own once well established, according to University of Oregon Extension. Contact your local county extension office to test your soil (for a nominal fee). 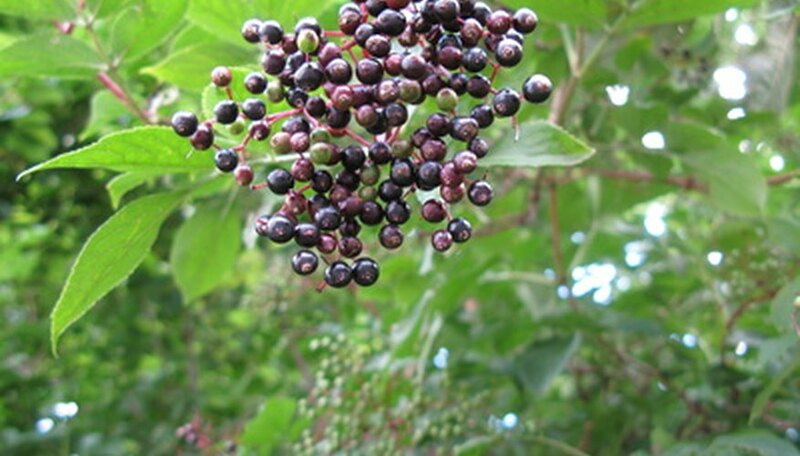 Elderberries will grow in a variety or soil types with a variety of pH levels. But they grow best on nutrient-rich soils. The results will inform you of any nutritional deficiencies in your soil and dictate the amount of fertilizer you need to apply. For the best results, incorporate any recommended amendments into the soil six months to one year before planting. Dig a hole for your elderberry bush. Make it three times wider and just a little deeper than the elderberry's current container. Fill the hole with water and allow it to drain. If the water takes more than a few hours to drain, move your elderberry bush to another, better-draining spot. Above almost all else, elderberry bushes need well-draining soil, according to Canada's Ontario Ministry of Agriculture. Remove the elderberry bush from its current container and loosen its roots by gently pulling them away from the root ball with your fingers. Plant the elderberry bush so that it is at the same height in the hole as it was in its nursery container. Do not cover the top of its roots with more than 1 inch of soil. Pat the soil down with your hands to firm it and remove any air pockets in the soil. Water the elderberry bush until the soil is moist to the depth of the elderberry bush's roots. The best way to do this is to lay a slow-running hose near the base of the bush for five minutes or so. Spread a 1- to 2-inch layer of organic mulch around the planting area, but keep it at least 3 inches away from the base of the elderberry bush itself. Continue to keep the planting area moist in this fashion until the elderberry bush establishes itself and produces new growth. Pull any weeds that crop up around your elderberry's planting site until the elderberry grows large enough to dominate them. Elderberries grow most vigorously when planted in full sun (although they can tolerate very light shade) and moist soil. Early spring is the best time to plant an elderberry bush. Plant neighboring elderberries six to 10 feet apart. Wear your gardening gloves when handling an elderberry bush. Aside from the flowers and ripe berries, all other parts of the elderberry are toxic. According to the online resource Old Fashioned Living, even the berries have traces of toxic alkaloids, though these are destroyed when the fruit is cooked.